A recent UK tribunal case has found that Uber drivers are not self-employed and so should be paid the minimum wage and holiday pay. Is this to the advantage of actual and potential drivers or not? Uber and like businesses in the ‘shared economy’ have represented a breakdown in the traditional social contract between employers and employees (Isaac and Davis, 2014), incentivised by the rejection of the post-World War II economic and social democratic consensus, in favour of neoliberal economic restructuring based on the premise of “pushing for greater profits and more flexible contracting with employees” (Kalleberg, 2000). The distinction between self employment and employment has enabled Uber to externalise proportions of labour costs unseen in the traditional taxi industry, since ownership of factor inputs and the burden of factor input degradation is placed on self-employed affiliates, who operate subject to Uber commissions and service charges, therefore allowing Uber to pay employees below minimum wage in reality. The tribunal decision to enforce a UK minimum wage and allow holiday pay should improve labour and income security, however I will argue these advantages will be limited by the lack of other employment rights and the potential for Uber to maintain similar flexibility levels through zero-hours contracts. 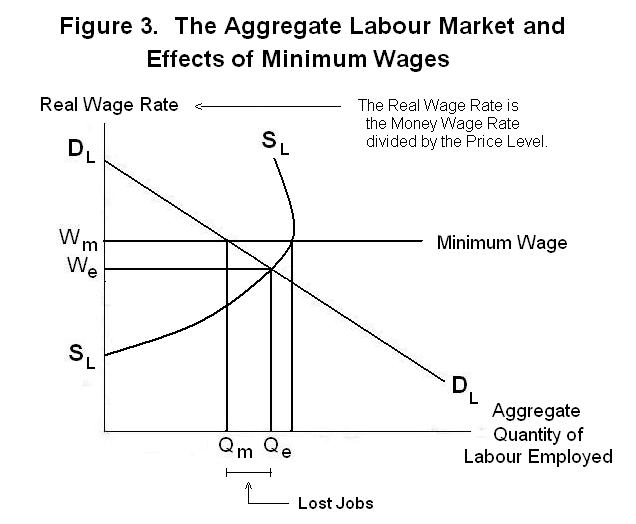 Traditional labour market theory states that the introduction of a minimum wage will only have an impact if it exceeds the market equilibrium rate. 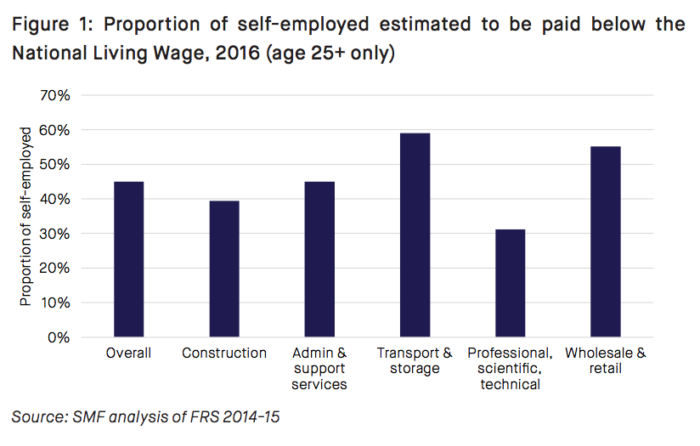 As such, since it is estimated that nearly 60% of over 25s in the self-employed transport and storage industry are estimated to earn below the National Living Wage in the UK (SMF:2016), major improvements in driver welfare should be achieved from enforcing a guaranteed minimum wage. However, for Uber specifically, ensuring a minimum payment per hour may not improve driver welfare at all. Data-analysis of Uber driver-partners who drove a minimum of one hour a week during October 2014 in major US cities shows the reported earnings per hour to far exceed any state minimum wage and the average guaranteed contract wage in the regular taxi industry. The issue for Uber driver-partners is therefore not the guarantee of the wage rate itself, as the available median hourly earnings are more desirable than the traditional taxi industry which abides by minimum wage standards, rather the problem is the burden of expenses on drivers which degrades take home pay to a level often below the minimum wage. Hence, for driver welfare to be improved, other employment rights such as the right to reimbursement from an employer for business expenses, like insurance and fuel, should be guaranteed to Uber employees. Undoubtedly the most cited advantage of driving for Uber is the flexibility of employment, but the majority of drivers are unable to earn a living income from Uber alone, with 62% working full-time or part-time on another job alongside Uber (Benenson Strategy Group: 2014). This suggests the nature of labour supply is to achieve top-up pay to reach a target income, and so implementing a guaranteed minimum wage should reduce the quantity supply of labour and while increasing income per hour, may not increase total earnings, as the income effect on labour quantity exceeds the substitution effect more quickly. However, the income-substitution effect does not adequately explain the determination of earnings in the case of Uber. 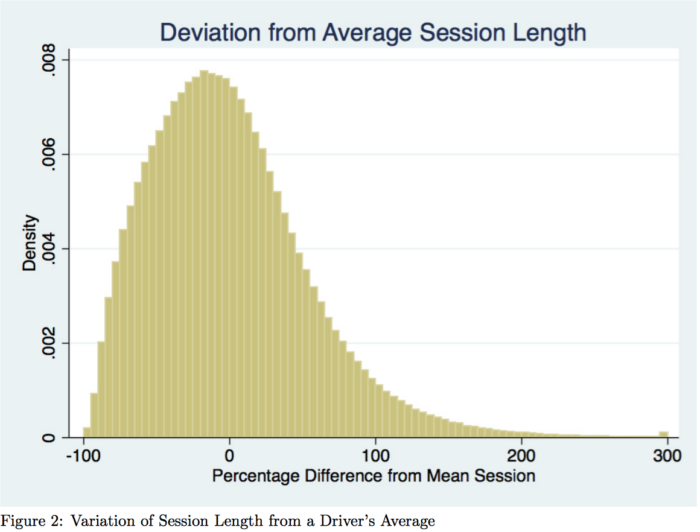 Defining an ‘active session’ as the total time a driver is either serving a ride request or available to accept a trip, analysis of UberX drivers gave a median activity of 3.47 hours and a positive skew towards shorter sessions, with only 5% of sessions exceeding twice the mean, compared to 18% below half the mean (Chen and Sheldon: 2015). Furthermore, drivers were shown to be more active and extend session activity during surge pricing windows, suggesting that short term income increases are more important in motivating labour supply than income targeting. This conclusion is supported by BSG survey data showing 65% of drivers to either drive 25% less or 25% more in any given week than the week previously (Hall and Kreuger: 2015), demonstrating the incentives of flexibility and variable pricing. Thus, implementing a minimum wage is unlikely to reduce hours of labour supplied, increasing total earnings for current and potential drivers. So far it has been assumed that the demand for and competitiveness of Uber services have remained constant, though in reality enforcing a minimum wage could have detrimental effects on the effectiveness of Uber’s business model. The minimum wage represents a certain marginal cost of labour in conjunction with the previous system of costs proportional to the value of trips minus service charges and commission. Consequently to maintain profit levels, Uber may increase the percentage commission, causing an increase in price for consumers, and a reduction in work availability for Uber drivers. The specificity of minimum wage impacts on Uber drivers depends on the elasticity of labour demand, which is intrinsically linked to the price elasticity of demand for Uber services, since if taxi demand is inelastic then total revenues for Uber can be maintained or increase despite an increase in costs, as the cost burden falls disproportionately on the consumer. Therefore taxi services and employment opportunities at certain times of the day and year, as well as particular weather conditions may be lost. The responsiveness of flexible Uber services to changing levels of demand is characterised by the surge pricing model, which raises the price of trips subject to an algorithm when demand outstrips supply in a location. It does this through a surge multiplier on the base fare, price per mile, and price per minute (Chen and Sheldon: 2015). A higher multiplier occurring when demand outstrips supply is representative of the point elasticity of demand for uber services, with factors such as poor weather conditions, maintenance of substitute transport, and timings of major entertainment determining this effective demand. Enforcing the minimum wage, raising the marginal cost of labour, would therefore restrict the incentives for Uber to provide services and offer employment to these times of elastic demand, resulting in the loss of services at less popular times, reducing the hours available to current and potential drivers. Hence a distinction is made between the beneficiaries of implementing the minimum wage, with the 62% working with Uber as a secondary employment opportunity benefiting the most as their supply of labour hours is unlikely to outstrip Uber demand for labour, while the 38% who rely on Uber for full time employment would be unable to work enough hours at the offered wage rate to sustain a living income. Though, it should be noted that Uber operates almost exclusively in cities which have disproportionately high taxi demand throughout a standard day compared to the UK as a whole, potentially limiting the disadvantages of lost employment opportunities. Despite this, Uber’s payment model is distinct from the labour market average, since it offers incentive pay through the ‘Boost’ scheme, which acts in a similar way to the ‘surge multiplier’, though not in conjunction, meaning that effects on incentive based pay are likely to be more pronounced than in the blanket labour market; the average bound worker receives only 33p in incentive pay per week in the labour market as a whole (Papps and Gregg: 2014). Consequently, current and potential uber drivers may see an increase in guaranteed pay through the minimum wage, but see limited advantages in total income due to the reduction in overtime and incentive pay opportunities. In contrast, guaranteeing a minimum wage introduces a new variable into the potential pay off to drivers, causing the incentives to shift from maintaining the most competitive reputation to maintaining the minimum reputation required for continued employment by Uber. 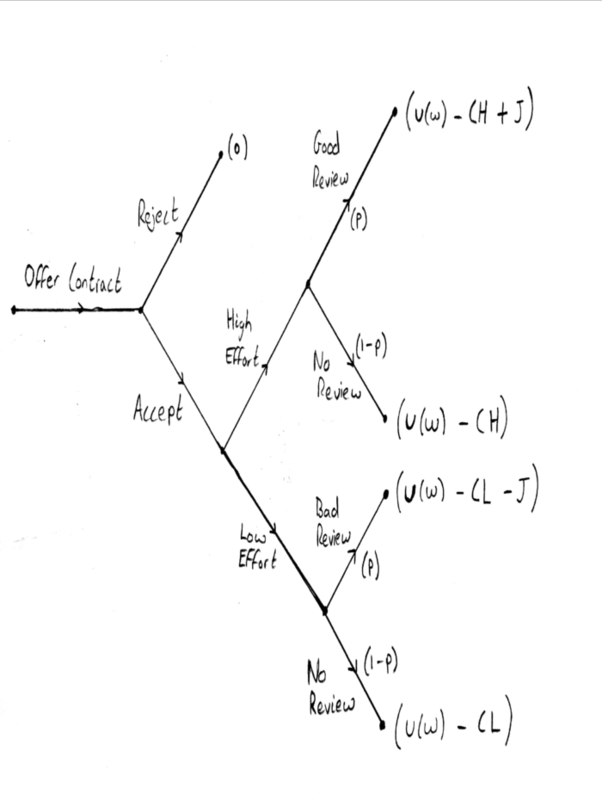 The game tree below represents this by modelling the utility a driver receives from the minimum wage as u(w), the costs to the driver of high and low effort as CH and CL respectively, the probability of receiving a good or bad review as p (0<p<1), and the change in future employment from a review as J. Calculating the expected value of high and low effort respectively, for E(H) > E(L), then 2pJ > CH - CL, and therefore for Uber drivers as agents in the principal agent problem to satisfy Uber’s long term profit maximising objectives with their short term utility maximising motives, the change in employment opportunities in the future from receiving reviews, proportional to twice the probability a review is received, must exceed the additional cost to the driver-partner of providing a superior service. In reality the probability of receiving reviews will vary slightly by consumer preferences, and the impact of each review will be subject to diminishing marginal returns, but the underlying point remains that the guarantee of a minimum wage per hour, can have significant detrimental effects on Uber’s quality of service and competitiveness. This is shown further by the prisoner’s dilemma under the conditions that the marginal increase in individual employment from providing a good service does not exceed the extra cost of that effort, also known in this case as the tragedy of the commons or the free rider problem. If after a minimum wage is guaranteed there are not sufficient incentives to provide high service individually, then drivers are motivated to shirk on their service, receiving the guaranteed wage minus the cost of low effort, in the hope that other drivers will maintain Uber’s service reputation by providing high effort, however when a high proportion of Uber drivers shirk, they all lose out on future employment in the long run. For Uber to maintain their long run reputation, they must possess sufficient power to enforce a high level of minimum effort, for example by increasing flexibility of employment, improving Uber’s capability to hire and fire workers relative to performance. 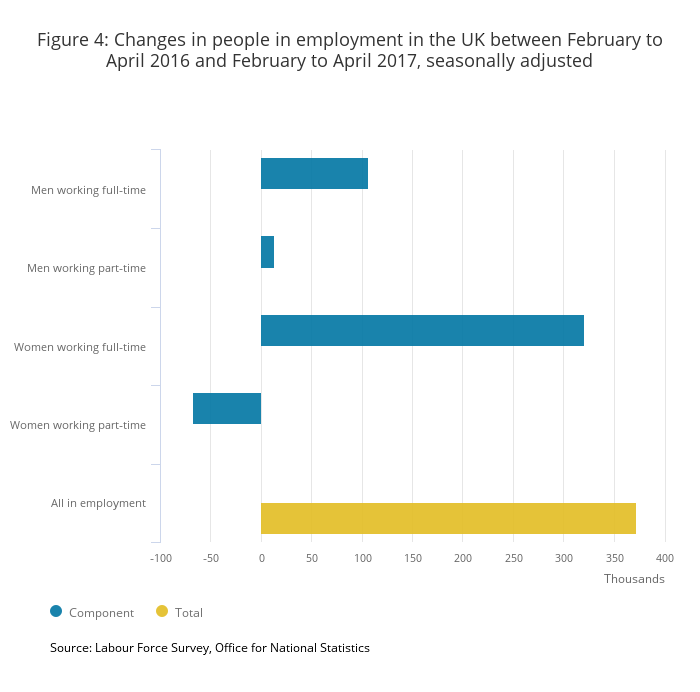 In the UK, the most suitable option would be to swap the current selfemployment system with zero hours contracts, which guarantees a minimum wage but maintain the employers right not to offer work; in November 2016, 1.7 million such contracts in the UK did not guarantee any working hours (Full Fact: 2017). The impact on current and potential drivers will likely be a reduction in flexibility and higher dissatisfaction with employment opportunities, since 32% of UK zero hour contract holders report wanting more hours, compared to 9% of people on other employment terms (Ibid). While zero hours contracts may be useful in maintaining the appeal of Uber to potential drivers in providing flexibility, they also remove the employer’s obligation to provide other employment rights like protection against unfair dismissal, and those relating to maternity and redundancy (Brinkley: 2013). However, one potential benefit of the switch could be that employers are obligated to pay the minimum wage when workers are on standby and are required to be available even if no work is provided (Paper and Dar: 2015), meaning that in times of low Uber demand, drivers are still guaranteed the minimum wage rather than being reliant on completing trips. Guaranteeing holiday pay is certainly the more minor of the two proposals, since its impact is limited to increasing the marginal cost of labour, which following the previous analysis of minimum wage increases to marginal cost, would reduce the profit maximising motive of Uber to provide services in times of elastic demand, reducing the available hours of employment to current and potential drivers. Though, since the majority of Uber drivers supply part-time labour, the impact of these costs relative to total costs of the $69bn valued Uber (Bloomberg: 2017) will be minor, while providing significant improvements to worker welfare, promoting better physical and physiological wellbeing (WTD: 2003). The tribunal ruling is therefore a foundation for improving the worker welfare of current and potential Uber drivers, however greater employment rights need to be guaranteed for workers for these advantages to truly be shown, such as maternity rights and protection from unfair dismissal. Uber drivers represent a form of labour which has been re-commodified by labour market liberalisation in an increasingly globalised world, causing labour to become more flexible to demand and supply and creating a group of workers reliant on insecure employment (Adriaanse: 2016). The alternative of zero-hours contracts means that Uber can easily maintain flexibility, providing no advantages to driver employment stability, while also restructuring earnings to maintain high effort within the labour force without significantly increasing costs. These precarious working conditions have, through a legal void created by rapid technological and economic change, enabled certain industries to exploit workers. Hence, labour law should seek to manage this trade off between business competitiveness and labour security, by reworking employer-employee relations for mutual benefit, perhaps through the creation of a new employment status of the ‘dependent-contractor’, with employment rights specific to the shared-economy.